There's no need to worry about where "to go". We have you covered.....literally. 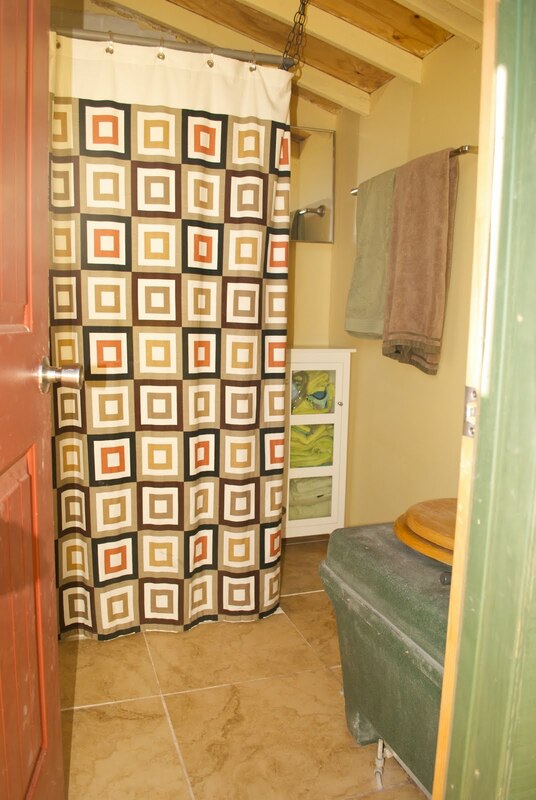 An 8 X 5 foot luxurious toilet and shower retreat awaits you just 20 quick steps away from the yurt. With the environment always front of mind at "Yurtcation" we have decided to install an odor-free compost toilet, saving water and the laborious task of building a septic tank. 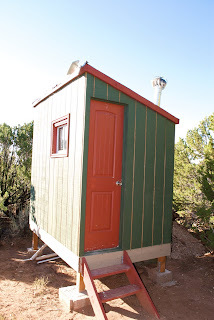 The "Outhouse" is no ordinary, run of the mill state park facility crapper. It's fully insulated, dry walled, and tiled, so you can enjoy every moment of your stay. Heck, it's so comfortable, you might even decide to set up a cot inside and spend the night. 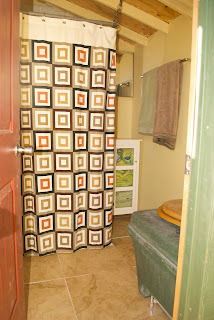 The shower is a super sweet 5 gallon solar bag that can be hung inside the stall. There is a lantern and small heater in the outhouse as well, so you can see what you're doing, and stay warm and cozy the whole time. 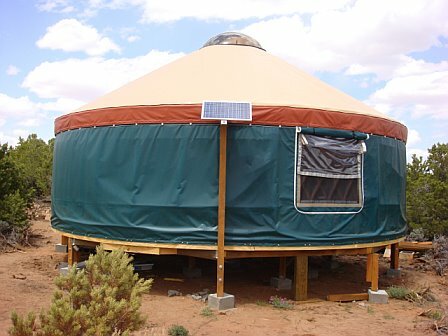 All soap at the Yurt is biodegradable so you can wash yourself and the dishes guilt free! 1.The Yurt is equipped with two 30 Watt Solar Panels, 2 12-Volt Batteries, a 6 Amp Charge Controller, and a 600 Watt Inverter.2.The 30 Watt Panels are charging the batteries at approx. 4 amps per hour of sunlight.3.The energy goes through the 6 Amp Charge Controller, to the batteries, to regulate how much and at what speed the batteries are charged. 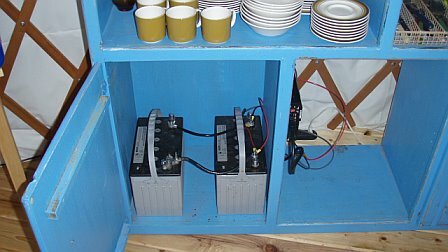 When completely full, the batteries have a combined 220 “Amp-Hours” of capacity. Or approx. 2400 Watts of energy.4. You never want to go below 50% of this capacity. So, you have approximately a 110 Amp-Hour “budget” to work with, (or 1200 Watts) depending on how much energy you use, and replenish each day.5.The energy from the batteries is then made available through the Invertor, where you can plug AC appliances directly into, or through the provided power strip.6.Each electrical appliance has an Amp rating. For example, the ceiling fan is .5 Amps, and a cell phone charger is approx. 1 Amp. Most appliances will indicate both Volts (V) and Amps (A) on a label.7.The inverter cannot handle more than 600 Watts of energy usage at any given time. To calculate total Watts per appliance use this equation. Volts X Amps = Watts. This means that you cannot plug in larger, high voltage appliances, such as power tools, blow dryers, etc.8.Each day, you can keep a rough estimate of the amount of energy being consumed, and the amount of energy being replenished into the batteries. Be careful not to keep appliances running all night long, and be conservative with your energy use.9. A similar way of looking at this, is that the 30 Watt Panel receiving 4 hours of sunlight will give you about 120 Watt Hours to work with each day, in addition to the initial 1200 Watt energy bank in the batteries if completely full. Remember Volts x Amps = Watts, so you can figure out your watt hours each day.